Even before the United States acquired California after the Mexican War (1846-48), many heading for California used the isthmus crossing in preference to the long and dangerous wagon route across the vast plains and rugged mountain ranges. Discovery of gold in 1848 increased traffic greatly. In 1847 a group of New York financiers organized the Panama Railroad Company. This company secured an exclusive concession from Colombia allowing construction of a crossing, which might be by road, rail, river, or a combination. After surveys, a railroad was chosen and a new contract so specifying was obtained in 1850. The railroad track followed generally the line of the present canal. The first through train from the Atlantic to the Pacific side ran on the completed track on January 28,1855. The gold rush traffic, even before the completion of the railroad, restored Panama’s prosperity. Between 1848 and 1869, about 375,000 persons crossed the isthmus from the Atlantic to the Pacific and 225,000 crossed in the opposite direction. Prices for food and services were greatly inflated, producing enormous profits from meals and lodging. The railroad also created a new city and port at the Atlantic terminus of the line. The town that immediately sprang up to accommodate the railroad offices, warehouses, docks and shops and to lodge both railroad workers and passengers soon became and remains, the second largest in the country. United States citizens named it Aspinwall, after one of the founders of the Panama Railroad Company, but the Panamanians christened it Colón, in honor of Columbus. Both names were used for many years, but because the Panamanians insisted that no such place as Aspinwall existed and refused to deliver mail so addressed, the name Colón prevailed. The French Panama Canal Company purchased the railroad in 1880 to assist in their attempt to build the Panama Canal. In 1904, the United States purchased the New Panama Canal Company’s assets from the French, including the railroad. The United States rebuilt and operated the railroad until 1979, when it was transferred to Panama under the terms of the Panama Canal Treaty. 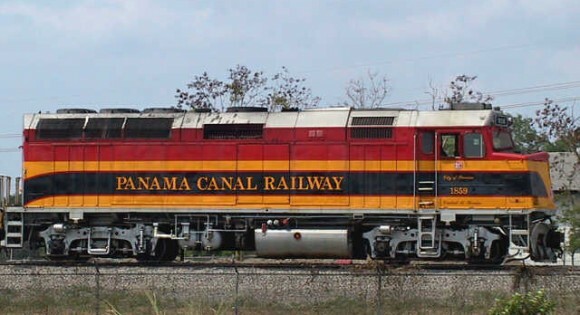 In 1998, Panama privatized the railroad and awarded a 50-year concession to the Panama Canal Company, a joint venture of Kansas City Southern and Mi-Jack Products, to rebuild and operate the line. They’ve spent upward of $60 million on the renovation–and it shows. Indeed, this railroad has quite a history and for the round-trip price of $35, offers quite a ride. The passenger cars are old Amtrak units, rebuilt in New Orleans and rigged out with paneled walls, wooden shutters, plush carpet and faux-leather seats. The train travels a route parallel to the canal so, at different points during the one-hour trip, you’ll happen upon signals, waterways, reservoirs, pristine rainforest and rolling countryside. The main purpose of the track is to resume the rail transport of containers from coast to coast. It reduces the often 12-hour transit time by ship to a mere 90 minutes. The train is also a good way to commute from Panama City to Colon and an absolute bargain compared to the cost of a car service or a taxi ($120 for the round trip). The new “reborn” railroad began operations in 2000. Going from Panama City to Colon, you will board the “Executive Express” at the Corozal train station for the historical ride alongside the Panama Canal. The station in Panama, located near the Balboa Port, is nearing completion but the Colon terminal is still under construction as of early 2006. The first train departs Panama City at 7 a.m. and the last leaves Colon at 5:30 p.m. Tickets can be purchased at either station or on the train.